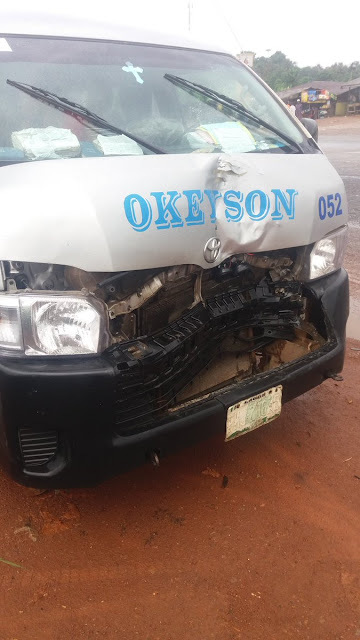 A Nigerian lady identified as Maka has taken to twitter to narrate on how the bus she was traveling in was attacked by Fulani Herdsmen along the Benin-Ore Expressway. According to her, she was on her way to Lagos from Owerri and just some few mile after Ore, the attackers appeared from the forest and stood in the middle of the road to attack on-coming vehicles. It took the swift action taken by their driver who decided not to stop, but rather accelerated and took the attackers by surprise as they scampered for safety. My mum and I left for Owerri as early as we could since we were to head back to Lagos the following day. We woke up early, got to the park, I wrote down our names in the manifest (with fake numbers just to "stick it to the man" I guess. Lol). Anyway, the beginning of the journey was pretty much the usual; a "preacher" got in to "spread the word" and was able to get the passengers to give him money just before he got down not too far from the park. Despite the fact that I halfheartedly listened to what he said, I still said my very silent "Amens" because I had the fear of the Lord and I wasn't about to tempt Him before an 8 hour long journey to Lagos. As soon as the "preacher's" session was over, I put my earpiece on, ready for the journey. Not too long after, I heard faint singing through the music buzzing in my ears. At this point, I was irritated at the interruptions I was faced with. Apparently, a passenger had started her own round of inside-the-bus church service. Again, I reluctantly joined them in prayers just to be safe with the Big Guy. Again, I put my earpiece in when that was over. The journey continued smoothly. We got to the ever popular Ore at about 12noon which was pretty decent considering we left Imo at 8:30am. The driver announced that we would be spending 30minutes, people objected to this, saying that it was such a long time to spend just waiting around doing nothing. Anyway, we all got down to stretch and go for a pee. My mum and I noticed an elderly man whom she pointed out must have had a severe stroke due to the way one side of his face sagged and how it took him forever to walk. We talked about how sad it made us feel to see him in such pain. We also took a minute to gush over a baby one of the passengers was carrying. She had the fullest, "curliest" and darkest head of hair with the most serious facial expression ever to be worn on a baby which in a weird way, made her look extra cute. As usual, I put my earpiece back in and decided to play a game of Solitaire (its probably the only game I know how to play). Only this time, I was interrupted by what I sensed was chaos. I looked up from my phone just in time to see my bus hit a silver jeep right in front of us and in the blink of an eye, it swerved in the other direction (apparently, it had seen attackers in front and was trying to escape them, but he braked so suddenly that we hit him with full force and the impact sent him flying. Then again, who hits the brakes when things like this happen? You accelerate the F outta there and clear anyone in your path - but I digress) As this was happening, a group of men holding machetes and guns raced towards us, trying to take advantage of the fact that we had had an accident. At this point, I threw myself over my mum who was seated in front as best as I could to protect her (not sure what good that would have done if things had gone sideways now that I think about it). My mum was already screaming "blood of Jesus, blood of Jesus! ", a phrase that was chorused in unison by other passengers. One of the attackers came straight for my mum but his machete barely missed her window because the bus driver really stepped on his accelerator with all the strength he could muster with me beside him shouting "don't stop! Keep moving!" as loudly and calmy as I could. I felt he needed to feel like he wasn't in this alone. Just ahead of us were 2 other attackers waiting for us in the middle of the road. Again, I kept repeating to the driver that he dared not stop or slow down. Thankfully, he didn't. At this point, I should hail this driver. He really held it down for everyone in the bus. The attackers waiting ahead realized that our bus showed no signs of slowing down, so they ran off but not without trying to swing their weapons as closely at us as they could. At this point, the bus was crying for help. Remember we had an accident earlier. The bus was smoking but we kept moving till we were sure it was safe enough to stop. We finally parked at a village and got down to say our prayers, catch our breaths and check the damage done to the bus. As usual, the villagers gathered around us. When we told them what happened, they echoed one another, giving our attackers a name, Fulani Herdsmen. My brain blew up!!!! Maka and her mum were just attacked by Fulani Herdsmen? Whaaaaaaaaa?!!! I started to really panic (like I wasn't scared before) and my only priority at that point was to get my mum and myself out of that village because I felt the attackers would come back. I decided to leave the small group that had formed around the bus to hitchhike. I held up my long maxi dress, adjusted my pink silk scarf to look decent enough for the task I was about to take on. I had never hitchhiked in my life (I only see these things in American movies). Anyways with my thumb out, I beckoned to cars to stop for me. A lot of them drove past without even looking at me. After what seemed like 20mins, a taxi stopped but sadly, he wasn't going my way. I kept flagging down cars until finally, a black and white Camry stopped. I was so surprised that I didn't even move until I was so sure he stopped for me. As soon as it clicked that it was for me, I ran all the way to his car, out of breath, I told them what happened. Yes. Them. Two men I didn't know were offering to take me to Lagos for free and I was about to take it. I just kept pleading the blood of Jesus under my breath as I ran back to my mum to tell her the news.